The bin kind of works like a swimming pool skimmer. The Virginian-Pilot reported that the new piece of technology is said to be the first of its kind along the East Coast. NORFOLK, Va. (AP) — A floating trash bin is now sucking up refuse in a Virginia river. The Virginian-Pilot reported Monday that the new piece of technology is said to be the first of its kind along the East Coast. It’s called the Seabin. 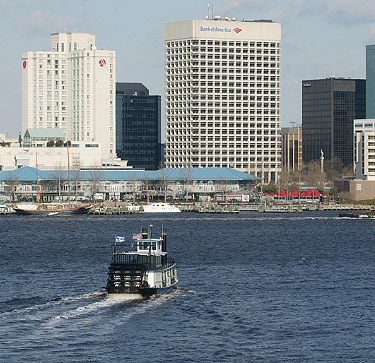 And it has been installed along the Elizabeth River in downtown Norfolk near where the Battleship Wisconsin is docked. A company based in Chesapeake, Wartsila Defense Inc., donated the bin and plans to donate more by January. The bin kind of works like a swimming pool skimmer. Water and trash are pulled into a filtered bag. Two Australian-born surfers came up with the idea after always noticing trash and debris in the water.